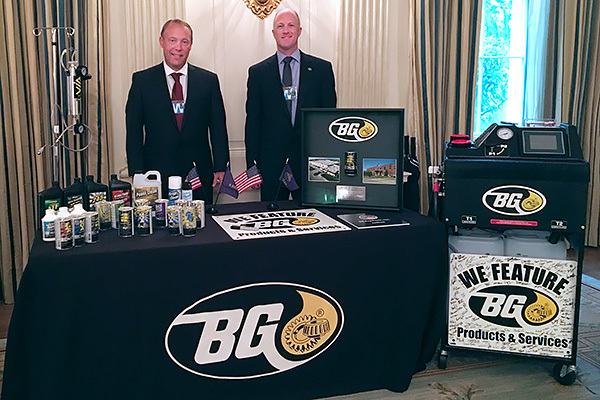 BG Products at the White House for Made in America | BG Products, Inc.
WASHINGTON, DC – BG Products, Inc., was selected to represent the state of Kansas at the Made In America Product Showcase hosted at the White House on July 23, 2018. 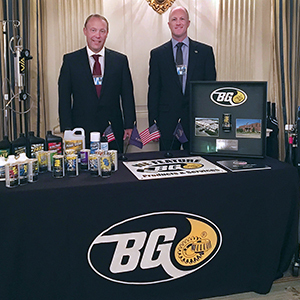 A few of BG’s highest quality products and equipment were on display on the State Floor in the White House. BG Products, Inc., representatives Tim Albritten and Shawn Farney presented President Donald J. Trump with a commemorative BG 44K® can encased in a shadow box signed by employees in Wichita, Derby and El Dorado, Kansas. Manufactured in Kansas since 1971, BG’s professional-use products and equipment improve efficiency, miles per gallon and long-term reliability of vehicles. BG focuses exclusively on products of the highest quality only available through our authorized distributors. Unique to the industry, BG Products works, as it always has, through a global network of more than 100 independent distributors in all 50 states and more than 60 countries internationally. Every business day, more than 40,000 shops, dealerships and technicians in the U.S. use BG products, services, tools and equipment.